GI Joe may be the world’s most famous military action figures and have been enjoyed by boys for over 40 years. The saga of GI Joe pits the good guys against the worldwide terrorist organization known as Cobra. GI Joe was originally introduced as boys action figures in the 60’s. The action figure line was bolstered in the 1980’s and relaunched with a new action figure line, comic books, and an animated TV series. In 2009 a new action figure line was launched along with a blockbuster movie. The good GI Joe hero’s are Sargent Slaughter, Duke, and Snake Eyes. Cobra villains are Cobra Commander, Storm Shadow, and Destro. GI Joe costumes are sure to be popular for tears to come. The new GI Joe costume line is in adult and kids sizes. The most popular costume are sure to be Cobra Commander costume, Snake Eyes costume, and Storm Shadow costume. Cobra Commander costume is true to it’s original blue military style outfit. 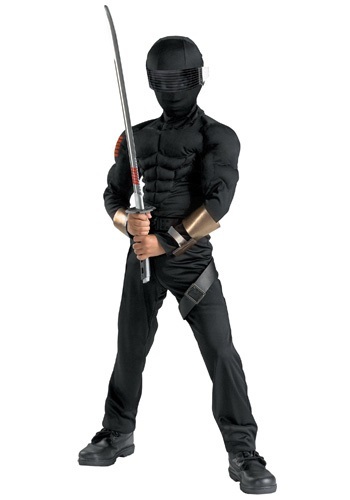 Storm Shadow costume and Snake Eyes costume are both ninja style costumes. Snake Eyes costume is all black costume and Storm Shadow costume is an all white costume.